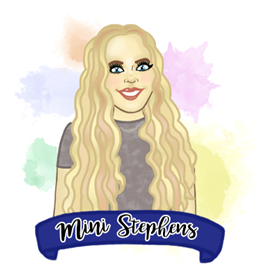 Mini Stephens: The Perfect Pancakes! With Shrove Tuesday looming, I thought posting the simplest and easiest pancake recipe would help guide along anyone who has absolutely no idea where to start with making their pancakes. This is the recipe we've used in my household for years, it's from one of my mum's really old cookery books and I find it really easy to follow. I can't make pancakes without following a recipe, I just get confused over how many grams you need of each ingredient and the order in which you put them into the bowl - so hopefully this recipe will help you out too. 1) Mix the flour and salt together, and then add the egg. 2) Beating well, gradually add all of the liquid until smooth. 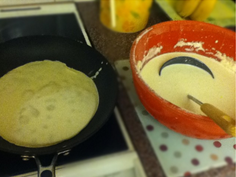 5) When the pancake begins cooking the yellow batter will become a slightly darker colour and air bubbles will start to appear in the middle of the pancake. 6) Using a plastic spatula or fish slice gently separate the pancake from the edge of the frying pan by running the utensil around the edge of the pan. 7) Once you're satisfied the underneath of the pancake is cooked either flip the pancake by throwing it up into the air in the traditional way or slide your kitchen utensil underneath the pancake so the pancake sits on the spatula or fish slice and then flip it over. 8) Once the pancake is cooked, slip it from the pan straight onto a plate and begin the same process again - ensuring you wipe the pan with more oil each time. 9) Finally, serve your pancake with your favourite things and bask in pancake heaven - Some examples are Caster sugar, Lemon juice, Chocolate sauce, Toffee sauce, Maple syrup, Golden syrup and of course, nutella. I hope this recipe helps make your pancake day more stress free and little bit easier. Let me know whether you use this recipe, and what crazy and wonderful things you like to put on your pancakes! "Try not to be like pancakes and get all flipped out, be like syrup, and go with the flow"